The brush is designed to animated a part of an image like wheels, rotating space objects, and so on. Here is an example of an animated galaxy. The following parameters are available for animation tailoring. The last tab allows you to change the position of the pivot point and shape of the circuit. 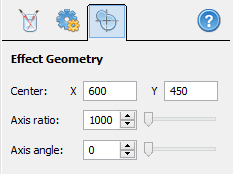 The default parameters of axis ratio and angle define a circle. If you need to rotate points of the image along an ellipse, change the above parameters or drag the controls in the view window.